Flight with microlight aircraft offer an unmatched view making them perfect for sightseeing and photography. Ultralight Flight is a great medium to enjoy the magnificent Pokhara valley with mountain range in the north, lakes inside the valley and beautiful city. An ultralight is a very light aircraft that has no window and seating for only two persons, including a pilot and a passenger. Because of the ability to reach to close to the mountains, tourists love the experience of flying in small machines. 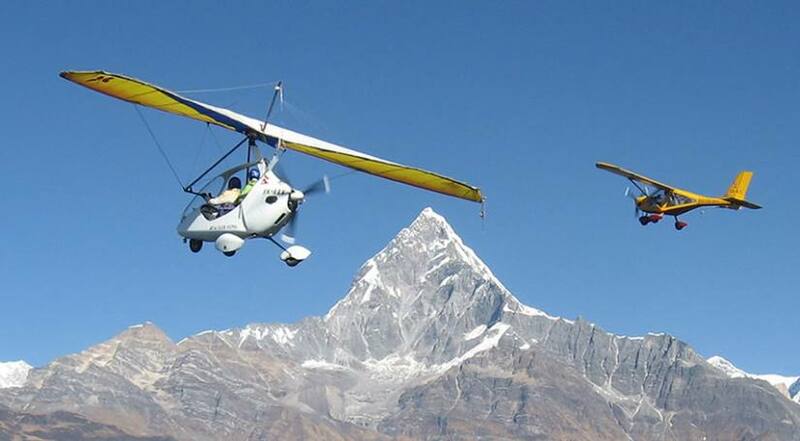 Professional ultralight flights started in Nepal in 1997 AD and is claimed to be the first in South Asia. Every year autumn to early spring is thought to be the best period for Ultralight flight. Luxury Holidays Nepal organizes Ultralight flights for our customers offering a variety of flights with the amazing Himalayan backdrop of the Annapurna massif. This Ultralight flight will give you best pleasure, with a safety which no one can beat. The breathtaking snow views and the dazzling icy peaks of the Himalayas around will amaze you. This is the shortest flight available and takes you over Sarangkot, Phewa Lake, Peace Stupa, Power House, Seti River & also offer a panoramic view of Annapurna massif with over 8000 m.
This flight, takes you slightly higher and little farther and offer a great view Mt. Fishtail Foothills, Naudanda Hill, Sarangkot Circle and you will fly over the Tibetan refugee camp and the view is simply superb. The flight takes you over Pokhara city valley, Fewa Lake, near Sarangkot hill, over the Buddha monastery, and Panoramic View of Annapurna Range, Mt. Fishtail Foothills. You fly at an altitude of 9,000 feet above sea level and you go very close to Fish Tail peak and enter the Seti Valley. Airport pick up and drop by tourist vehicle.